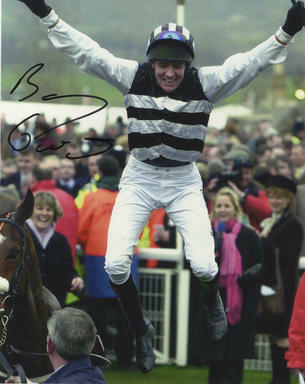 This is an In Person signed Colour 10" x 8" Photo of the Irish National Hunt jockey. Barry Geraghty (borns 16 September 1979 in County Meath, Ireland) is an Irish jockey. Geraghty rode his first winner in January 1997, three years later he became the Irish Champion jump jockey for the first time. On the 2 November 2009 he rode his 1000th winner under National Hunt Rules in Uk and Ireland when the Nicky Henderson trained Duc De Regniere won at Kempton. He won the Grand National in 2003 on Monty's Pass. Also that year he won five races at the Cheltenham Festival, including the Queen Mother Champion Chase on Moscow Flyer, he repeated that win in the 2005 Cheltenham Festival, also winning the Cheltenham Gold Cup on Kicking King for trainer Tom Taaffe. In 2009 he won the Champion Hurdle on Punjabi the Arkle Challenge Trophy on Forpadydeplasterer and Triumph Hurdle on Zaynar. In winning the Champion Hurdle he became the first jockey to have won the big four races at cheltenham (Champion Hurdle, Champion Chase, Stayers Hurdle, Gold Cup) and The English Grand National.